Last Sunday Nicky Morgan, Secretary of State for Education and Minister for Women and Equalities, announced that all public sector organisations will be required to publish information about their gender pay gap. The Civil Service has reported its gender pay gap data at an organisational level, and by grade since 2008. The current gender pay gap in the Civil Service is 9.8%, a drop from 11% in 2014, and is at the lowest level we have ever recorded. 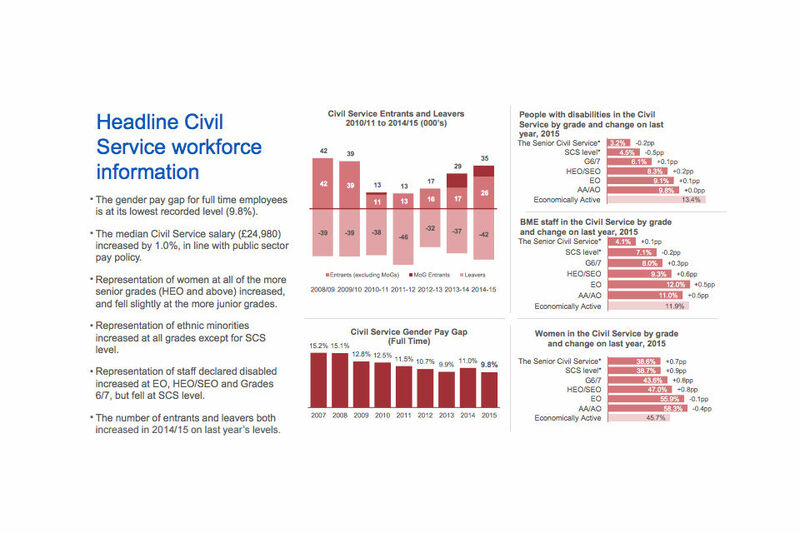 Headline Civil Service workforce information to Q2 2015. Click for full report. We know that simply publishing the pay gap does not solve the underlying problems. Sunday’s announcement was an important reminder that the gender pay gap highlights wider issues relating to gender inequality that the Civil Service, as an employer, must respond to. Paying men and women a different amount for the same work, if the difference cannot be explained objectively, has been illegal for 40 years. However the gender pay gap, the difference between men and women’s average salaries, reflects the types of careers that men and women enter and the levels of seniority they reach. We believe passionately that the Civil Service should be a genuine meritocracy and a true engine of social mobility. Every talented and hardworking person should be able to progress in the Civil Service, no matter what gender they are. A year ago we published the Talent Action Plan, responding to the Hay Group’s Women in Whitehall: culture, leadership and talent report. Since then we have refreshed the Talent Action Plan and launched the Removing Barriers Programme. Since the Talent Action Plan was published we have implemented shared parental leave for all civil servants and launched a new Planning the Parental Leave Toolkit to help both parents and line managers. Single gender recruitment panels are now by exception only. At our International Women’s Day Celebrations on the 9th March, we launched the Civil Service Job Share Finder. This online tool is supported by job share guidance and over 900 people have registered to use the site since March. Flexible working and job sharing ensures that employees can balance caring responsibilities with a stimulating and demanding career in the Civil Service. The Civil Service Gender Champion works closely with women’s networks across departments, to encourage the sharing of best practice, such as mentoring and identifying role models. We are also sharing understanding of gender equality issues with the private sector. On Monday, we held a joint Civil Service/EY Gender Summit. The event provided an opportunity for Civil Service Gender Champions, network leads and senior leaders from EY to discuss candidly the barriers that prevent both organisations from retaining female talent and how to make organisational culture more inclusive. We have made significant progress, but we know there is more work to do to create a culture that provides the opportunity for talented individuals regardless of gender, or any other visible or non-visible differences, to rise to the top. So, there is no gender pay-gap as we pay men and woman the same rate. Talk about clickbait headlines and misleading figures. The pay gap isn't just about the rate of pay. Perhaps reading into it might reveal more. Paul: People in departments that are mostly staffed by males get paid more than people in departments that are mostly staffed by females. That's hardly reasonable. And there are other factors at play also, including who gets promoted etc. I think this is a difficult conversation to even get off the ground in HMRC whilst we are still paying people such widely different rates for the same job due to pay range disarray. Until two experienced individuals get the same rate for the same job we are failing in the equality stakes full stop. What about the fact that there are four people of the same grade sitting on my section doing exactly the same job who are all on completely different salaries due to lack of pay progression? Is that not a much more important issue to tackle? Here here !!! I get ranked against people who get paid thousands more than me because they happened to be in a better position on the scale when the music stopped on pay progression. Why not sort out the inequality that means that some staff members have to outperform people who get paid a lot more than they do in order to have even the remotest chance of catching up ? There are huge amounts of inequality in pay in the Civil Service, why just focus on gender ? Why not look at the fact that an AO in HMRC gets paid more than an AO in the Home Office who gets paid more than an AO in DWP despite the fact that the CS Competency Framework means they should all be being measured to the same-ish standards. I'm sure it would help reduce the difference between salaries if there was actually any way of proceeding from the bottom of the pay ranges to the top. There are both men and women languishing at the bottom of the pay scales whilst undertaking exactly the same work and exactly the same expectations as those being paid several thousand pounds more, sat next to them. If it is illeagal to pay men and women different amounts for the same work why does the department continue to use a pay scale that means staff cannot reach the maximum? I am fortunate enough to be on my max but many of my colleagues are paid less despite having been in the job for a number of years? "Paying men and women a different amount for the same work, if the difference cannot be explained objectively, has been illegal for 40 years." Can anyone explain 'objectively' how having a pay range which you cannot progress through within a reasonable time so staff in that grade are paid different amounts for the same work is not illegal? Paul, I think you are correct - there is no PAY gap, there is a "promotions and career opportunites" gap. I'm not entirely sure how HMRC's plan to retreat from local offices into a handful of big regional sites will increase career opportunities for women. In fact, given that women still tend to be the primary carers for children, it will mean a distinct downturn in opportunities for them as they face increased commute times and childcare costs. Yes - the above DOES all apply to men who are primary carers as well, but they are still in the minority, so the "rationalisation of the Estate" will hit female workers far harder than male workers. Perhaps it might also be an idea to remove the pay gap for staff of both genders who are of equal grades (and more often than not doing the same jobs) regardless of length of service. 15 years a civil servant and still NOT on the max despite being given an assurance I would be there within 5 when I joined!! Yet there are people doing less complex work who are there by virtue of the date they joined - Is that fair? It's not only the gender pay-gap they must tackle, its also the pay-gap that exists between employees due to the lenght of time they have been in the Service. No-one will get to max pay now but I have witnessed time and time again newer members of staff providing a far superior level of service but their wage is as much as £2,000 less than longer serving members of staff. I know this comment may upset some of the longer serving members of staff (of which I am one) but we are all meant to be equal in the eyes of our employers. Even though this has been made illegal it still happens. Now, is this because it's a male in a role? Or is it because the particular person in that role deserves to be paid more, it just so happens that he is male? You can't limit it to gender, however, it does seem very strange that there are so many more men in senior roles that are earning more than women. It still seems as though managers presume it is women that are going to go off and have children, come back part time after maternity leave and are perhaps therefore seen as less valuable than men. I think it is maybe the way in which women are less valued and therefore aren't given the same opportunites to develop and to progress up the career ladder as men do. If it is illegal for men and women to be paid different rates of pay for doing the same job why do we allow men and women to languish at different points on the (now non existent ) pay scale ensuring that this "illegality" can continue. We do pay men and women different amounts for the same work. We seem to pay everyone differing rates for the same work. For example, the ladies on my team are on a much higher hourly rate than me simply because they were on max before the pay freeze. Even with 1% increases imposed, the gap still gets wider as 1% of their wage rate is more of an increase than mine. The only way to solve it is to have a set rate for each grade. Should I rage that its due to gender and try to use some spurious Politically Correct point just to grab attention, or just admit its down to the unfair way the pay rises are administered and that gender has nothing to do with it? Indeed. Pay grades eliminate the pay gap. By suggesting there is one by it self is twisting the truth. There is not an equal representation in all grades and as such when you look at the whole Civil Service it gives a figure such as above. Which is is wrong as the argument of the 'pay gap' is when the positions are like for like. As has been mentioned above, it is also down to the fact that different civil service departments pay very different rates of pay, to the tune of thousands of pounds higher on the minimum for an AO and with even starker differences at the top of the grade range. And women/med are concentrated in very different proporions in different departments, some having a much more "macho" culture. So a pay grade is no guarantee of equal pay, CS wide. Paying men and women a different amount for doing the same work is wrong and any initiative to prevent this should be applauded. However, the culture within HMRC is to pay men and women of the same grade, doing the same work, often sitting next to each other, possibly £3-4,000 a year more. With no chance in the current climate for the lower paid person to reach the actual going rate for the job. Meanwhile those paid the going rate for the job have been penalised by taking pay cuts in the last few years. Pay equality for all regardless of gender but not for time served? I work for the DWP and am paid less than both my Male and Female Colleagues in the exact same job role with the same expectations, and I am more experienced than some. My pay differs by 10% in some cases and by more since the DWP has taken on staff from the Local Authorities. I am being discriminated against because of time served in the Civil Service. I will never attain parity with my colleagues on pay however long I remain in the Civil Service (currently 14 years). The Civil Service has reported its gender pay gap data at an organisational level, and by grade since 2008. The current gender pay gap in the Civil Service is 9.8%. So there is a gender pay-gap as men, when looked at as a group, are paid on average almost 10% more than women. 10% of the median average salary in the civil service is almost £2.5k. Female representation is highest at AO level (58.3%) and representation then progressively drops through the grades (women make up 38.7% of staff at SCS level). Now, looking at society as a whole: if female nurses and male nurses are paid the same salary; and female engineers and male engineers are paid the same salary, but nurses are more likely to be female, and engineers are more likely to be male, then looking at the broader picture men, as a group, are drawing in higher incomes than women, as a group. This has an impact on relations within the family and in society as a whole. (It is unfortunate that women, as a whole, are more likely to need extra income as they are more likely to be heading single-parent households.) This may not be the type of gender pay-gap that you assumed the term describes, but there it is. Money is power, so lets applaud the civil service for taking this issue seriously and taking steps to address it. Also, bear in mind that the published gender pay-gap figure only takes into account full-time salaries, so the actual pay-gap in real terms will be much higher as women are far more likely than men to take on the burden of caring responsibilities. No Paul, we must all submit to the feminist agenda. To narrow the pay-gap and achieve true equality, women must be obliged to climb the management chain, become politicians and into STEM fields and suchlike. It's a digusting betrayal of the sisterhood that many women are family-orientated, preferring a work-life balance, rather than be total slaves to work and career. The "feminist agenda" is actually that women should be able to choose (and not suffer detriment) between career or family or a combinaiton of the two, and that men should have exactly the same freedom of choice (without detriment). What problems are these then? Where have you established that there are any problems at all? Your analysis does not allow for the concept of choice, in this case, choices made by women when they decide, often with their partners, on how families will be organised and who will spend more time at home etc. These decisions are personal, but you seem to make a judgment that the choices made are wrong and are leading to 'problems'. I don't think you are qualified to say that. "Your analysis does not allow for the concept of choice, in this case, choices made by women when they decide, often with their partners, on how families will be organised and who will spend more time at home etc..."
A lot of the time these decisions are based on who earns more, as we see, this is often the male. Its difficult to track down the problem with just the overall pay gap, but no further breakdown in the attached statistics. Surely a pay gap breakdown by grade should be provided to help identify where there are problems? I was also interested to read about what the Civil Service is doing to tackle inequality, particularly as a Positive Action Pathway participant. The scheme is aimed at under-represented groups, yet women are penalised by effectively not being able to complete the scheme if they fail to time their pregnancies around the scheme dates. There's a lot of talk, but not much walking going on! "Paying men and women a different amount for the same work, if the difference cannot be explained objectively", has been illegal for 40 years. How come then that many consider HMRC to be doing precisely that? Others have commented on the absence of any prospect of moving through the pay grade and the inherent unfairness in that. However at the senior grades it is evident from the HMRC 2010 Equal Pay Audit that it is women who are disproportionately at the lower end of pay scales and on average are paid up to 8% less than their male counterparts of the same grade. Just as we had some welcome progression for female staff into senior grades, our employer froze or capped pay rises, so everyone is treading water (still). I strongly suspect this differential in rates of pay between one group of staff and another, which cannot be explained objectively, is why HMRC, a massive Govt department, has not published an Equal Pay Audit since 2010. What action will Nicky Morgan, Melanie Dawes or Sir Jeremy take in this regard? The silence is likely to be deafening. Very sad.